This generation has seen a variety of change occur on the gaming landscape with the introduction of microtransactions, the mass appeal of DLC, the rise of game prices, and the controversial "online pass system." At least one of those things are changing for the time being, with EA announcing it's no longer going to require an online pass for its games. 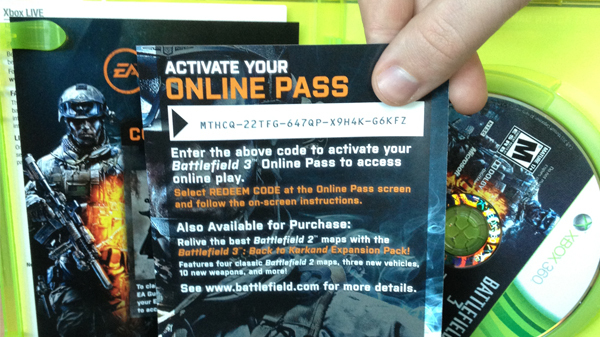 An "online pass" is a one time use code included with many multiplayer and co-op games which allowed players to access the game's online features. Players purchasing the game used wouldn't have this option and would need to pony up $10-$15 in order to access all of the content on the disc. The system has been controversial since it was announced and many high profile titles (and publishers) have adopted it including Battlefield 3, Dead Space 3 and publishers like Sony and Ubisoft. "Initially launched as an effort to package a full menu of online content and services, many players didn’t respond to the format, John Reseburg, director of Corporate Communications for EA said. “We’ve listened to the feedback and decided to do away with it moving forward. None of our new EA titles will include that feature." As negative as the feedback is/was for the online pass system, it did bring in a revenue stream to the tune of 15 million dollars annually for EA. It seems odd that EA would just abandon this. The skeptic in me sees this as related to a lot of the rumors about the new consoles, the PlayStation 4 and the next Xbox, blocking used game sales in some manner when they launch this Fall. Whatever the reason, at least for now, we won't have to worry about an online pass system in upcoming co-op games published by EA, like FUSE, which launches in just under two weeks. Page created in 0.5697 seconds.